When you just buy the latest and shiniest tool, you need to use it! If you are brand new to the tool you have purchased, expect to put in some time learning to use the tool. Did you just buy more online marketing tools? Great! Did you actually put them to use? Take a look at the image, above. What do you see? A wide variety of tools, right? 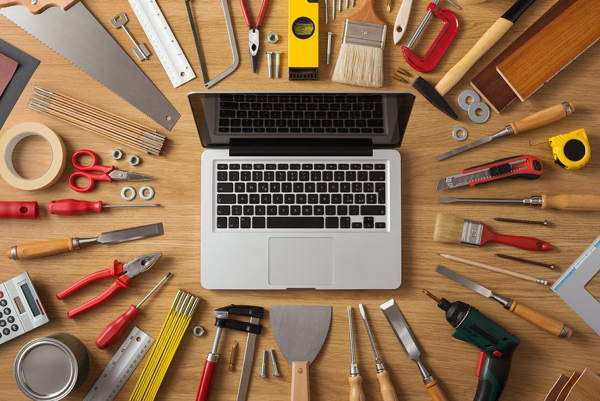 Chances are, most of us couldn’t name all the tools (except that big one in the middle). But a skilled craftsman can not only name each tool, but knows the role each tool plays. The job they want to accomplish will determine the tools they select. They spent time learning each tool. They spent more time mastering the tools. In time, they became very skilled. The same should be true for us when we use online marketing tools like autoresponders. We need to take the time to learn the tools. Then, we should spend time using the tools. In time, if we stay focused and consistent, we begin to master the tools. Why am I stating what appears to be so obvious? On a daily basis, I hear from someone who has joined TrafficWave. They want to prosper with our online marketing tools. If they are complaining about their lack of results, I look at their account. Over and over, I see that they have not started setting up their autoresponder. In some cases, they might have set up a few letters, but they don’t have a capture page set up. What do I do in these cases? I reply to them and direct them to take advantage of our training videos and our training wiki. As powerful as these online marketing tools are, they can’t do the work for us. They simply make it easier to do the work required to build our lists and follow up with prospects. Hammers don’t drive nails. Saws won’t cut the boards by themselves. Screwdrivers can’t drive screws on their own. Paint brushes won’t spread paint without the painter using them. As with any tools, we start by learning the basic. Then, as we continue applying what we learn, we get better and better at the job. The stories you see about those “overnight success stories” usually don’t mention the time spent learning and using the tools before their success came. Don’t be afraid to spend the time learning to use your online marketing tools. The results you can realize from proper use of your tools can be absolutely monumental.